August 7th brings another Crazy Cooking Challenge sponsored by Tina from Moms Crazy Cooking. This month brings new rules for the cooking challenge. In the past we have had to find the recipe that we would use from another blogger, this month we were able to use the recipe from other sources such as cook books or one that we have made up ourselves. I was happy about the change in rules, because I have a favorite recipe that I found in a Kraft food and family magazine. I have used it for several years and I have to say that is one of the best cheesecakes that I have eaten. Our daughter Krista is moving to Chicago next weekend so we wanted to get all the family together to have a nice going away dinner for her. When I asked her what she would like for me to make for her dessert she said she wanted caramelized apple cheesecake. So I decided to use this cheesecake for my challenge as well. 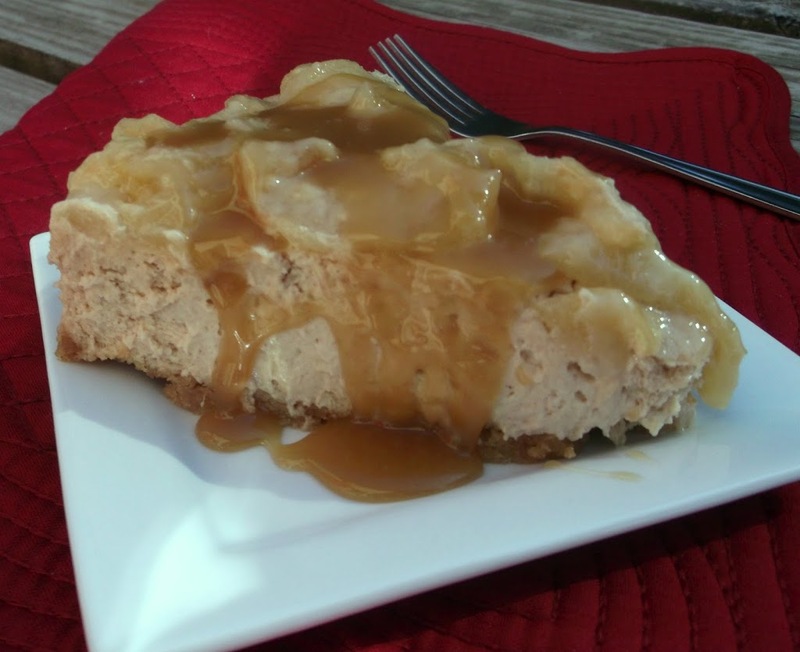 I looked around the web for a caramelized apple cheesecake and did not find anything close to what she wanted so I decided to make my own, using the Kraft recipe. Wow, this is really some cheesecake. Krista told me it was amazing and Mike told me it was the best cheesecake that he ever ate. Quite some complements, wouldn’t you say? So I guess I can say that they like this cheesecake. The cheesecake had a hint of cinnamon to complement the caramelized apples and to top it off I made a caramel sauce to drizzle over the caramelized apples. Mix all ingredients together, pat into a 9-inch springform pan. Set aside. Preheat oven to 350 degrees F.
Beat cream cheese and sugar on medium speed until well blended. Add sour cream, vanilla, and cinnamon; mix well. Add eggs, one at a time, beating on low speed after each addition just until blended. Pour into prepared crust. set. Turn off oven and open oven door and leave the cheesecake in oven until the oven has cooled completely, remove and set on wire rack until the cheesecake is cooled. Cover and refrigerate over night. Melt butter in a large skillet over medium heat; sprinkle sugar over. Stir until sugar begins to melt, about 1 minute. Add apples. Sauté until apples are brown and tender and juice form, about 20 minutes. Add cream and simmer until sauce thickens slightly, about 2 minutes. (Can be prepared 3 hours ahead. Let stand at room temperature. Rewarm apples over medium heat. Just before serving spoon the caramelized apples over the cheesecake. Add all ingredients into a small sauce pan and blend together. Over medium heat bring to a boil and boil for 3 minutes. Pour caramel sauce over servings of cheesecake that have been plated. The ultimate fall cheesecake! I love it! Caramelized apples AND caramel sauce? Yum, I’m in 🙂 This sounds amazing!!! That looks insanely delicious! You have no idea how bad I want a slice right now! Divine. When you have an apple orchard with 300 trees, you are always looking for new recipes using apples and this sounds great. Gosh, this looks so good! You really packed a ton of flavor in this. Totally delish – thanks. 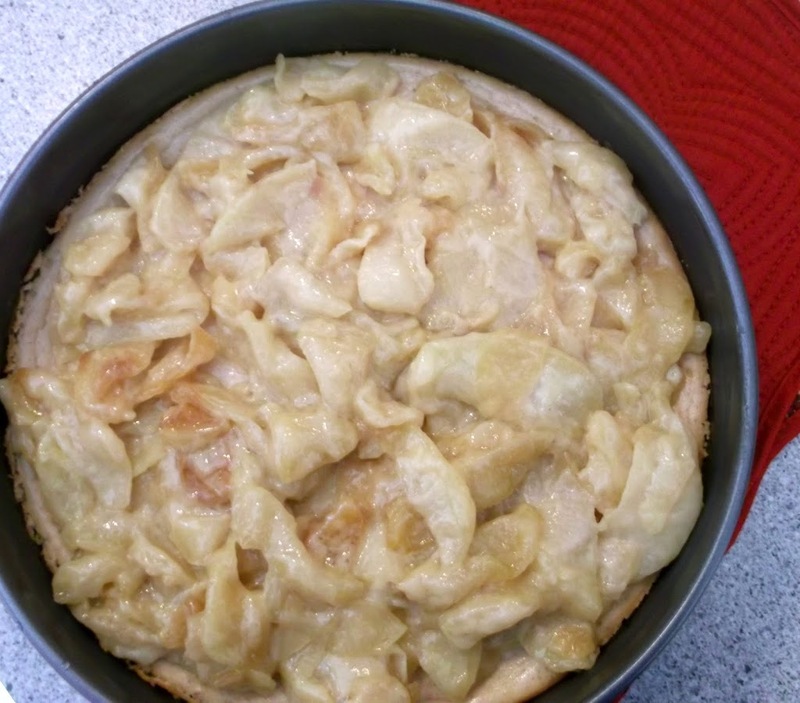 I love to bake applecakes here in autumn – but I’ve never seen an Apple Cheesecake before! 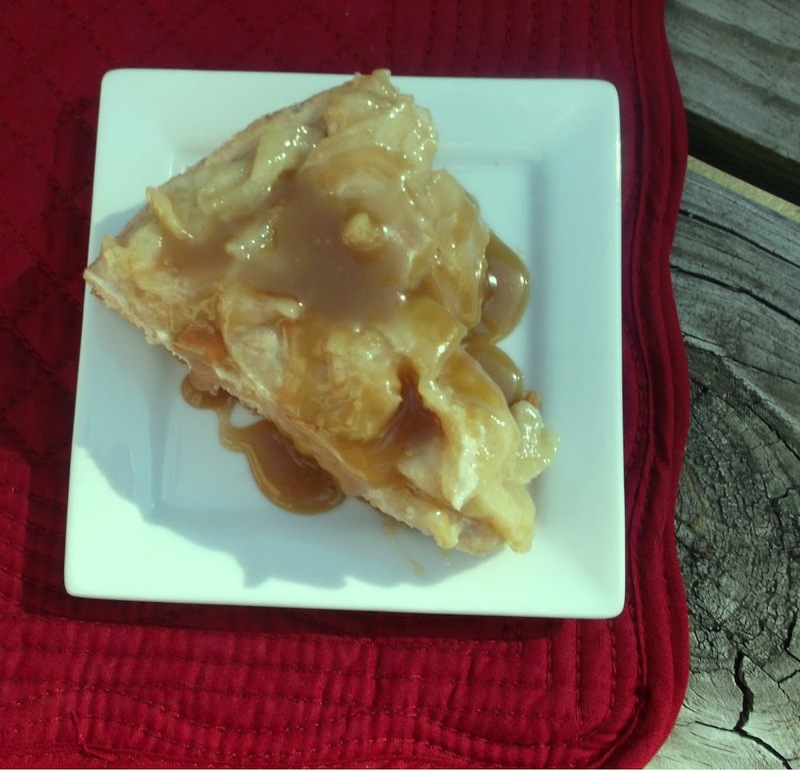 Your cake with the caramel sauce looks heavenly!